That stomach dropping exit poll moment will be seared into my memory forever. The stunned silence in the room hung over us like a shroud. My husband and I clung desperately to the hope it might be wrong. Paddy Ashdown seemed convinced of it – so much so he offered to eat his hat if it turned out to be correct. As the night wore on it became increasingly and horrifyingly clear Paddy was going to have to consume his hat in one big humiliating gulp. Making a mockery of all the previous polling predictions, the Tories had won a majority, something even the horrendous exit poll had failed to predict. On May the 8th, millions of us were filled with despair. The last five years had been bad enough, and that was with the Lib-Dems acting as some kind of brake on the Tories callous instincts, albeit a rusty one in need of major repair. 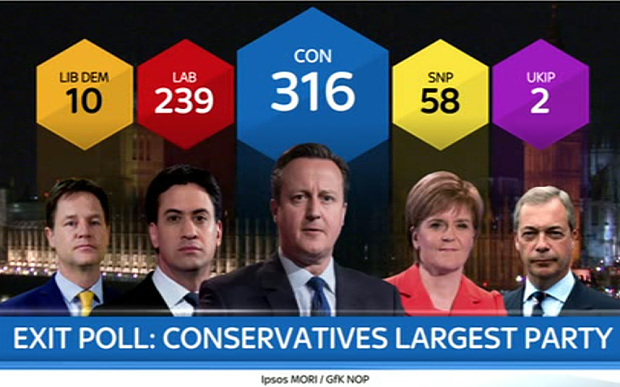 Before we’d had time to draw breath, let alone take stock, Ed Miliband threw in the towel. The prospect of a new leader did nothing to lift us out of our doldrums. If anything it made us feel worse – especially when the only leadership candidates on offer used every interview they gave to hammer home the idea we had to appeal to the hummus buying, John Lewis shopping voter to become electable again. What this ‘new labouresque’ analysis failed to consider was how many more voters there are in the UK who can’t afford to shop in John Lewis. Did these candidates realise for instance, that 80% of people in the UK earn less than £31000 a year? And even if you were fortunate enough to be the type of voter these candidates said Labour needed to attract (and seeing as my husband and I live on a combined income of approximately £35000 a year, we fall into this category) didn’t they realise we have adult children, saddled with enormous student debt, working on zero hour contracts, earning too little to ever buy a home of their own? Didn’t they understand that we have ageing parents who are having their care visits cut to pay for a banking crisis they didn’t cause? Didn’t they grasp the fact we don’t just care about ourselves? Was it so hard for them to understand that even slightly better off voters care about the young, the sick, the disabled and the elderly? Like many others, I initially chose to support Andy Burnham. His statement about putting the heart back into Labour resonated with me. Labour had without doubt lost its heart. Ed Miliband had tried to shock it to life a few times, but I always got the feeling there were too many advisers and Blairites wrestling the defibrillator out of his hands before it could get it into a steady rhythm. But my support for Burnham was short lived. His pendulum like statements, one minute to the right, then to the left, then back again, had me thoroughly confused. He was clearly trying to cover all the bases, a triangulation strategy he’d no doubt learnt under Blair, but as a result I couldn’t figure out what sort of leader Andy would make, other than a vacillating one. Not exactly inspiring. Maybe they should rename the triangulation strategy the strangulation strategy because of the way it kills off all hope and inspiration? Anyway I digress. Around this time I read a post on Labour list that reawakened my hope. Ten newly elected Labour MP’s, including Clive Lewis, Richard Burgon and Cat Smith had written and signed an open letter, calling for an anti-austerity leadership candidate to stand. That evening I visited a FB group I’d very recently joined to help me process the election result with other lost and despairing Labour party members, and shared a link to the open letter, with the proposal that we, the members, write a similar letter to back up these fledgling MP’s. One of the group members, Beck Barnes, was so enthused by the idea she volunteered to write it. Once she had finished, and we were both happy with it, Beck sent it to the campaign group Red Labour, where it was picked up by activist Naomi Fearon. 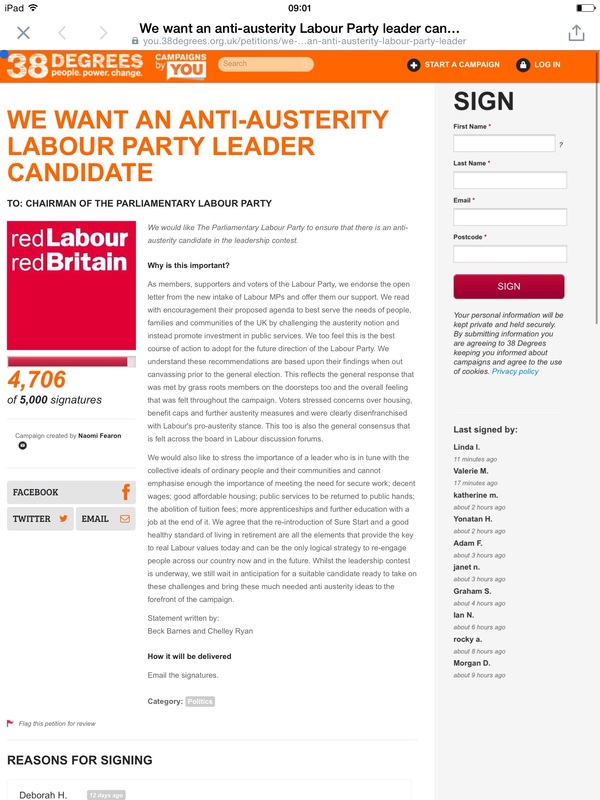 She was supportive and encouraging from the outset, and on our behalf converted the letter into a 38 degree petition, under the Red Labour banner, with myself and Beck as the signatories. The three of us tweeted and shared the petition morning noon and night. Twitter finger became a genuine complaint we all shared. I’m a holistic therapist by profession, and I can recall one evening advising my fellow campaigners (who by now despite the fact we had never met, were starting to feel like friends) to soak their hands in warm water to reduce any inflammation. We celebrated on FB whenever anyone of note signed or shared the petition. I remember how excited Beck was when the twitter star Artist Taxi driver signed and re-tweeted it. I was equally excited when John McDonnell signed it. Its funny looking back now, but I wasn’t as excited when Jeremy Corbyn signed it as he was less well known to me then than John. Our optimism and excitement was sorely tested though as the days went by. Despite a huge degree of support for our petition, the clock was ticking and no left candidate had thrown their hat in the ring. Nominations were being eaten up by the existing candidates and we were starting to realise there would be very limited options for anyone who declared so late. 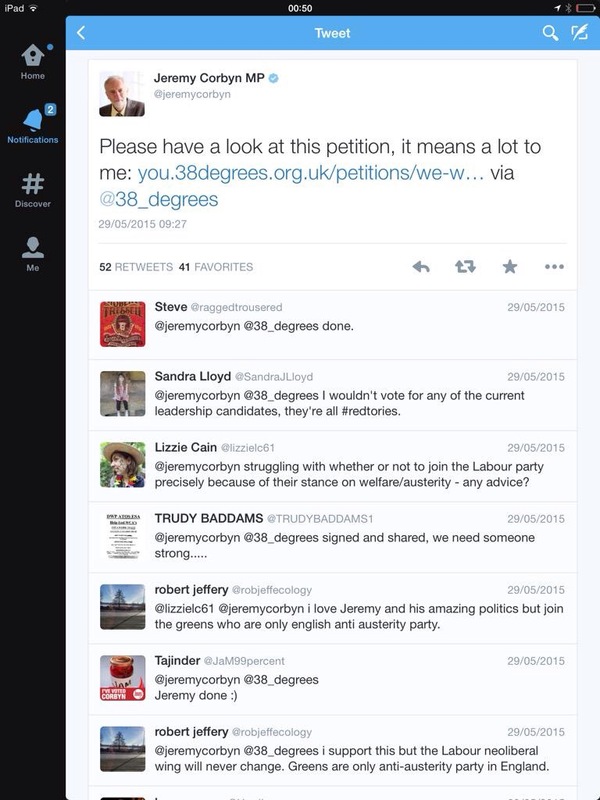 On the day Naomi posted our petition to John Cryer, chairman of the Labour party, which by now had over 5000 signatures, word went out on twitter that Jeremy Corbyn had stood. The rest is history…. I’ve started this blog to continue tracking this amazing story right up to a Labour victory under Jeremy in 2020, and beyond. And what better name for my blog than Turning The Tide? If this summers taught us one important lesson it’s this – when people don’t accept what they are given, amazing things can happen. Corbyn’s politics are commendable and infinitely better than the gangsterism of the Tories. But, it is not important that Labour, as a party, survives. If people do want a change to the exploitative capitalist gangsterism then Corbyn’s success in the leadership election can be catalyst to a genuine alternative. A gap needs to widen in British politics between the financial gangsters and their gimps in the Tories/UKIP/Liberal Democrats/New Labour and what is needed to overcome that. The useless constricting so-called “middle-ground” needs to fall headlong into that gap. What a terrific and inspiring post. Yes we can change things for the better and fight for social justice if we work together. Great article. I should add that I like houmous, even if on my Teacher’s salary I just about fall into your 80%. I think a lot of the old ‘middle’ are beginning to notice that they can’t afford John Lewis any more. It seems that free market capitalism, having pretty much annihilated the old industrial working class, is now eroding the middle class too. Saw a clip of the much maligned Jimmy Carter on a Michael Moore documentary last night: ‘We are no longer defined as people by what we do, but what we own.’- very prescient- and if things don’t change, a lot of us aren’t going to own anything at all. Brilliant as usual Chelley. How can one forget election night! I took the Friday off in preparation to stay up and follow the results. The exit poll shock was huge! As the results kept coming and confirmed exit poll I decided to go to bed completely dejected! The following morning the announcement of a Tory majority added insult to injury. Over the week end I was very depressed, I had no appetite for watching the news or going on facebook or twitter! I will never forget the excitement of Jeremy Corbyn’s nomination and the enthusiasm that followed during the leadership election campaign. Jeremy’s win shows people’s power and ability to achieve great things when the will is there, we must never forget that.